EDMONTON, Alta. – The Northern Alberta Institute of Technology (NAIT) has partnered with industry stakeholders to bring low-carbon fuel that can withstand all weather conditions to the long-haul truck segment. Working with Mack Trucks, Westcan Bulk Transport, and Oberon Fuels, the effort is supported by the Government of Alberta’s Ministry of Economic Development and Trade with funding of $368,000. NAIT researchers from the School of Applied Sciences and Technology will work to develop fuel moisture management technology for dimethyl ether (DME), which is a cleaner-burning diesel fuel alternative made from natural gas or methanol produced from biomass feedstock. 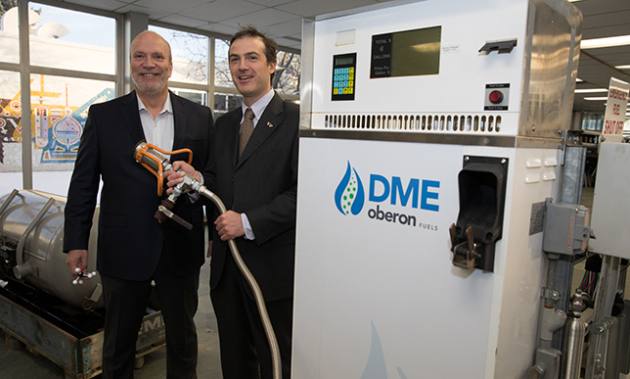 The technology aims to remove any residual water from the DME before injection into the engine, eliminated the risk of corrosion and reduced performance. NAIT plans to test the technology using Mack trucks from Westcan’s fleet on the Hwy 2 corridor between Calgary and Edmonton. Rebecca Boudreaux, president of Oberon Fuels, said her company’s effort to develop a new global transportation fuel has been accelerated by the support of NAIT and forward-looking companies like Mack and Westcan. NAIT president/CEO Dr. Glenn Feltham, left, and Dr. Paolo Mussone, NAIT’s applied bio/nanotechnology research chair.